Looks like I have some catching up to do! We've been really busy around here, as you might have noticed. The regularly scheduled home-related posts will be coming soon. In the meantime though, here's a recap of what we did over the Holiday weekend. As you might already know, we spent the whole weekend in Missouri for Trent's family reunion. This was our second year in a row that we made it down. I'm glad we went again, because it was a lot of fun. I'll try to make my recap short and sweet since I have some things to get to around the house, like dishes and laundry (still catching up from lost time this weekend). 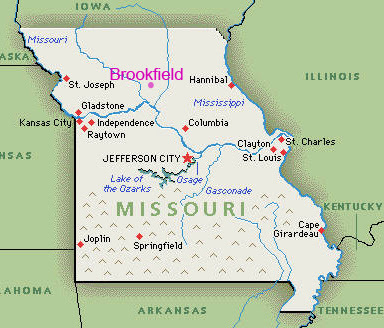 The town where we stayed is called Brookfield. It's a small town in central Missouri. I like to call it "the middle of nowhere." Although there are a lot of lakes and pretty wilderness areas around there. 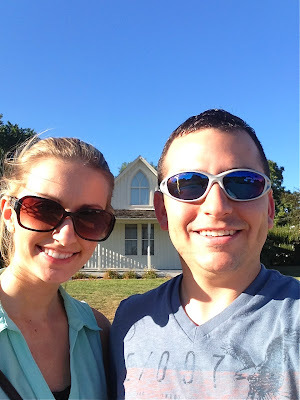 We stayed at a motel in Brookfield called the Martin House. We couldn't really book any of the larger hotels in the area, since they were mostly full, due to the Hot air balloon festival that always takes place every Labor day weekend. It was fun though, since most of Trent's out of town family ended up staying there, too. We drove around Brookfield lake the first night we were there, which was really peaceful and pretty. The reunion on Sunday was fun, too. It was at Pershing State Park again. We all sat around and hung out, and ate lots of food. And I watched the guys play washers (competitively), which was quite entertaining. 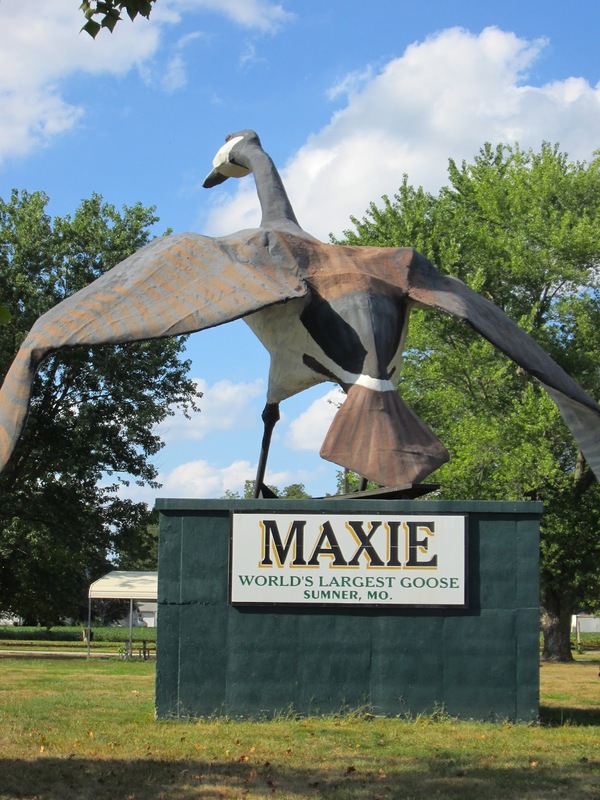 On the way back to the hotel after the reunion, we stopped in Sumner, MO to see Maxie, the World's Largest Goose. 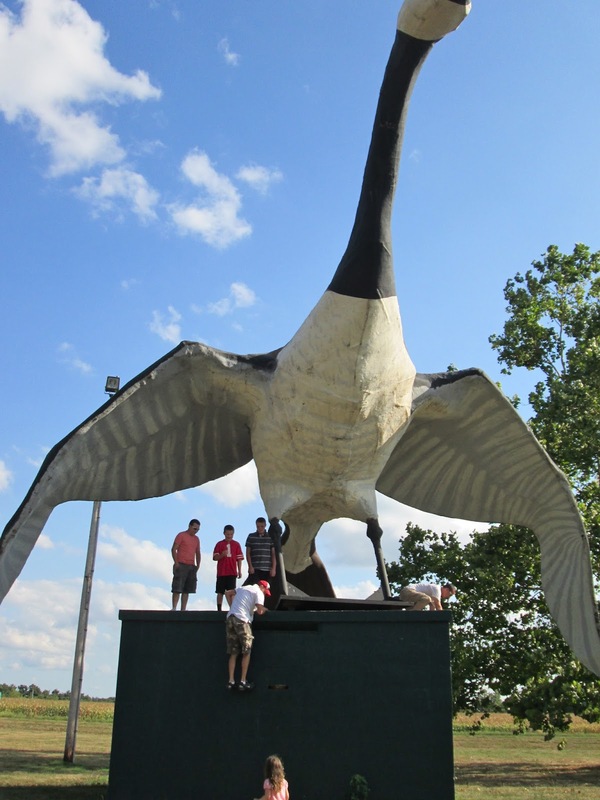 The guys all climbed on it. 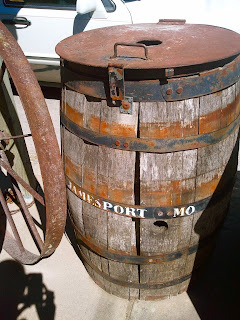 Monday, we drove home and took the long way, stopping at a few places along the way, like Jamesport, Missouri - the largest Amish community in the state. There were lots of little antique shops, which I will have a post about soon. And even stumbled upon the American Gothic House, from Grant Wood's painting American Gothic.